As mercury continues to touch the freezing point in Kashmir, parents have demanded an early winter break for lower classes in schools, saying they lack heating arrangements. 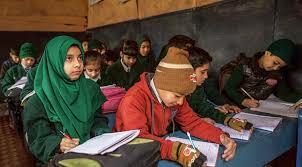 Mohammad Altaf, a resident of Baramulla, said children shiver in classes in the absence of heating facilities. “Unfortunately, schools do not have heating facilities due to which the children suffer. So, they should be closed for an early winter break because day by day, the temperature is decreasing,” he said. Another parent, Shakir Ahmad from Srinagar, said due to a dip in the temperature, the mornings were foggy, which was affecting visibility and creating the risk of accidents. “The children also feel cold while travelling. The schools must be closed for lower classes,” he said. The intense cold wave continues in the Valley and Ladakh region, with the coldest temperature recorded at -8.8°C in Kargil on Tuesday. In Srinagar city, the minimum temperature was 0°C. Most of the schools in the Valley lack proper heating arrangements and the majority of government schools do not even have proper electrification. While the government normally announces the winter break from December 15 in schools, this year, the parents have appealed to the authorities for an early announcement of the break. A senior official in the department of education said they were yet to decide the date of the winter break. “We will announce the date when it is final. But we will surely take into consideration the demand by parents,” the official said.